Explanation: The distance record for a quasar has been broken yet again. At the present time, no other object in the universe has been found to be more distant than the above speck. 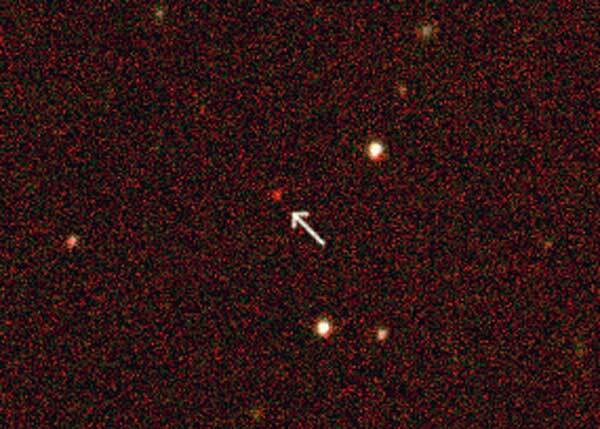 The recently discovered quasar has been clocked at redshift 5.82. The exact relation between redshift and distance remains presently unknown, although surely higher redshifts do mean greater distance. The above quasar is likely billions of light-years away and so is seen when the universe was younger than one billion years old, less than a tenth of its present age. Like all quasars, this object is probably a large black hole in the center of a distant galaxy. Don't close the record book yet, though. The redshifts to several other SDSS-discovered quasars are currently being measured, some of which might have redshifts greater than six.